Mabel came to Angel Wings Network, Inc in 2013 at the request of founder, Linda Roundtree. Mabel was retired from a long career in banking and real estate lending. In 2010 she became the primary care person for her mom and dad. Mabel’s mom had beat breast cancer twice, 20 years apart, but had congestive heart issues and her dad had been diagnosed with terminal lung cancer so she took care of them until they passed in the fall of 2011. Mabel came to Angel Wings as part-time coordinator and remained in that position until December 2016 when she had to leave to care for her husband Grant. Grant passed away in December 2017. In April 2018, Mabel returned as the Angel Wings Network, Inc. Coordinator. The commitment of Angel Wings Network, Inc., of helping folks battling cancer in our rural communities, touches Mabel’s heart and she feels blessed to be a part of this amazing group of dedicated volunteers. 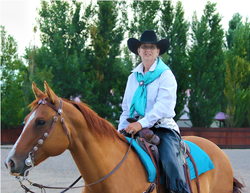 ​Toni lives in Council, Idaho and is the leader of The Angel Riders equestrian drill team. Her family has been touched by cancer in many ways. Both of her parents are cancer survivors and both of her grandmothers had cancer. She loves being a part of Angel Wings Network and The Angel Riders, who perform at rodeos and parades and fly flag that represent different types of cancer. She lives with her husband, Skip on a ranch outside of Council, Idaho. ​Paddy is a long time resident of Weiser. She is a retired Clerk from Washington County. She also serves as a guardian on the Washington County Council of Guardians. Paddy has been a member of the Board of Directors for over two years. ​Having been raised in Arizona, I relocated to Nevada, married and raised a family and lived there for 40 years. I relocated to Idaho as a widow after the loss of my husband to cancer. A lifetime of careers led me to work in banking, a Nevada casino doing soft count and cashiering, then telecommunications sales and service, then back in banking and investments department and then marketing department followed by accounting for a trust company and retiring. ​During the various career paths I became a caregiver for my elderly God Parents. My Godfather passed from cancer and my Godmother passed from heartbreak shortly after. My Dad who passed at an early age needed care and understanding in his last years. My Mom and I were caregivers for him and I helped support my mother through this. I then became a caregiver for my husband, who passed after a long history of rare medical instances, and in the last year was diagnosed with internal melanoma cancer. My mother was a source of strength for me as well through this challenge. ​I now have the opportunity to pay it back in helping with the Angel Wings Network family. I have gained strength and knowledge from what I went through dealing with the health issues and needs of my loved ones. My experiences enable me to share and help those who need care, understanding and knowledge as they battle cancer. This is not how I envisioned my retirement years, but I know the challenge and this work is a blessing for me. We are blessed that the community is there to support us and that God is always there to give a helping hand. Amen. Twelve years ago, when Darbie Correia-Dennison was diagnosed with Hodgkin’s Lymphoma she knew her life would never be the same. She just didn’t know her experience with cancer would come full circle and provide her with an opportunity to positively impact the lives of fellow cancer patients. Darbie is a native of Weiser, daughter of Art and Mary Correia, and brings with her over 25 years of experience as a teacher and school administrator. In November of 2015 I moved to Weiser from Fort Laramie, Wyoming. I retired in 2006 after working as a social worker/substance abuse counselor. The day after I arrived in Weiser I went to the yard sale Angel wings was having. When Mabel told me what the money went for I became very interested. I had lost 5 family members to cancer, plus my son had lost his in-laws, in the previous 4 years. Cancer devastated my family and I jumped at the opportunity to use my interest and counseling skills. I became a volunteer the next day. I love the work I am doing here and I became a board member in April of this year. I feel that we are doing a tremendous service to our rural community. ​John moved to Weiser, Idaho in 1976, starting JD Express as an owner-operator leasing company, and logistical specialist. In 1985, he started Action Truck Brokerage in Ontario Oregon, and then moved his business to Weiser. John is also the owner of Duvall Bail Bonds, and has been a leader in the industry for over 30 years. John is also a two-time cancer survivor and has lost members of his family to the disease. His knowledge and interest in the crusade to help others has brought him to Angel Wings Network to help further the development, sustainability and growth of the organization. As a lobbyist in the State of Idaho and neighboring states, he advocates and supports the efforts of Angel Wings Network, Inc. within our rural communities.